As the name and picture above suggest, Salted Shrimp Sauce is made by marinating tiny little shrimps in salt and fermenting them for a long time. 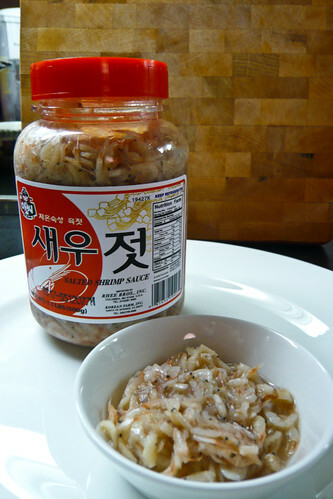 Salted Shrimp Sauce and Salted Anchovy Sauce make the two most important sauces used in making of kimchi. In general, the sauce is used in place of or with salt in various soups and dishes. A rule of thumb is that you could use Salted Shrimp Sauce (instead of salt or together) when making a dish or soup whose main ingredients are eggs or tofu. It should last for up to a year refridgerated.